Part 1: What Are My Weaknesses? Part 2: What Do Interviewers Want to Know Through the Question? 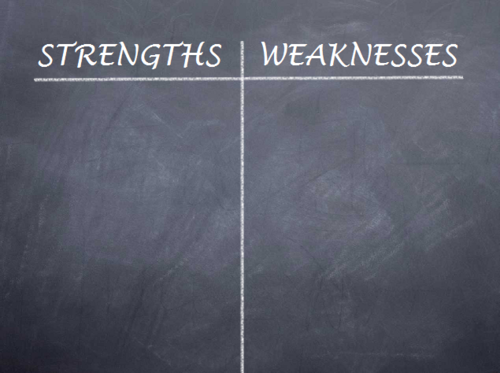 There are many different ways that you can answer when you are asked what your greatest weakness is, which includes talking about skills that aren’t detrimental for the job, or skills you’ve improved upon, and therefore turning a negative to a positive. If the interviewer asks you what your greatest strength is, you probably can get it figured out easily. All you need to do is to present your professional skills and speak about how you are the best one for the job. However, when asked what your greatest weakness is, that can be a lot more difficult to answer. It is not a trick question – your interviewer is just trying to learn about your own self-awareness and how honest you are. A good answer can demonstrate how well you can overcome a challenge, and present you as a professional who is committed to continued self-improvement. Below are some ways that you can tackle this question successfully. There isn’t anyone who couldn’t improve on something, however if you can explain how you’ve lessened a weakness by yourself, it will make you seem capable, strong and in charge of your professional development. Consider something you’ve struggled with but you are working on improving. You could, for instance, tell how you’ve never been great at public speaking, but that recently you’ve requested team leadership roles, ran meetings successfully, and discovered tools to make you feel more comfortable addressing crowds. You could also talk about something that used to be a weakness, but now is an accomplishment. For instance, explaining how you’ve always had trouble in math but you’ve taken a course in Excel that has helped you to do projects a lot easier. When your background doesn’t quite match the job requirements, or you realize the employer has hesitations about some areas of your experience, this is the perfect time to talk about these uncertainties. You can speak about something that is already a known hurdle for you, but also turn it around to show what your strong points are. For example you could talk about the fact that you don’t have any sales experience, but that the skills you’ve learned in the past five years doing fundraising are very relevant to the position, then go on to explain why. Pick a weakness which you can speak about in the most positive way. Are you stubborn, not able to delegate or neurotic? Try using things that are seen as professional strengths instead like persistent, thorough and dedicated. For example you could say that you are generally a perfectionist, and sometimes have a hard time letting a project go before it is totally finalized. This sort of answer will address where you need to improve, but does so in a positive light. Make sure you follow this with how you’ve taken care of the shortcoming and whatever strategy you choose, which sounds like you are completely genuine and to always end on a positive note. It is good to rehearse what you will say so you can give it easily, and even more importantly, precisely. If you take too much time talking about your flaws, it’s really easy to get yourself dug into a big hole. As quickly as you can, get past the weakness portion of your answer so you can get back to the important part – your strengths. There is just never a good answer to this question: what are my weaknesses; however, there are answers which are not as bad as others. Legitimate weakness – Things like chronic back pain, perfectionism or claiming you have no weaknesses are never good answers. Your ability to be an investment banking associate or analyst can’t be affected. Never say you are unable to work long hours, or you easily forget details, or you have difficulty working on a team. Your weakness has to be something you’ve been striving to improve upon. Test you character and serenity. Be honest, but you don’t have to give a list of every single flaw. Don’t forget that your answers can be played back to any of your references, so after the interview is over, your integrity could still be measured. You need to show them that you can keep cool when you are put on the spot, so they can see how you might handle yourself on the job. Make sure you are not a robot. The interviewer wants to hear a thoughtful and prompt answer. Avoid using any cliché answers. Think about your answer to the question before you get there, but do not sound rehearsed. Get a sense of your self-awareness. Whatever your answer is, it should show the hiring manager that you are capable of objectively examining your own weaknesses and strengths. Know how you improve your weaknesses. Answer in a truthful manner, presenting it as an area that you are developing instead of a weakness, and always tell the interviewer what steps you’re taking to improve this area. People want to hire someone who is aware of their own weaknesses and taking the necessary steps to improve. Examine your ability to handle tough questions. Your answer should not be overly general, but one that indicates you’ve given it some genuine thought. Incorporating a positive response into your answer is a really beneficial thing to do. Know the job you are applying for and make sure that your weakness won’t interfere with any job requirements. As with things like cover letters, fashion and grades, this question is more geared towards staying clear of a bad response rather than giving a good one.